After the treaties were signed around here, settling outstanding tribal land claims, and legally opening settlement in our region, we went to war. The terms of the treaties didn't match up with the expectations of the tribes. The small non-native communities contracted into bunkhouses. Hundreds formed units to both defend their farms and towns and to seek out Indians to kill. Eventually, the Puget Sound War petered out, Indian leaders were tried, hung and murdered. But, most importantly to the civil leaders here, we had spent money. Someone needed to pay. The debate over the war debt of the Puget Sound War is an interesting one that gets to the nature of our early settlement here. If it was a war, then Indian leaders like Leschi should not have been hung for murder in the years after the conflict. You can't commit murder if you're a soldier in a war. Also, if it was a war, roving bands of whites should not have spent the years following the war looking for Indians to kill, carrying writs from local courts. Certain judges apparently thought the Puget Sound War wasn't a war, or else there wouldn't be murderers. Just veterans. But, the instructions given to our congressional delegate Issac Stevens (who as governor led the war effort) in the late 1850s was to get federal repayment for our war debts. It was a war. 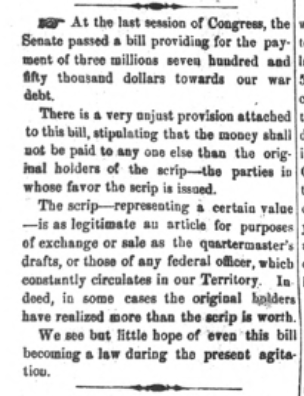 The Senate acknowledged the existence of a war, when they eventually passed $3 million appropriate in 1861. Obviously, that money was needed for another war. Its funny that that war, had a similar post war debate. Should the leader of the confederacy be tried? Was the Civil War a real war? If they were leaders of a real nation, then of course not. You can't put a national executive on trial for leading his country in war. But, if they were merely terrorist leaders, taking charge illegally of a portion of a whole country, then of course, put them on trial. Obviously, if we zero in on the case of Jefferson Davis (the President of the apparent Confederate States) we see a lot of nuance. If he's on trial, what happens if the federal government gets a bad result? He's found innocent? The constitutionality of secession is secured? In the end, it was better to just release him and leave the questions unanswered. But, because Jefferson Davis didn't join Leschi at the gallows, the Civil War was a war. Leschi was the Indian symbol to white Americans of the tribal cause. He was hung because there were enough people in charge in the territory that couldn't fathom him being anything other than a murderer. But, in their own split minds, they saw their service as soldiers. So, they sent Stevens to congress to get money for war debts. It wasn't until 1875 that the federal government really got around to putting the war stamp on the Puget Sound War, when they spent a much smaller sum ($50,000) to put the war debts to bed. We really did have a war it. It was asymmetrical. It wasn't pretty. We don't have battlefield sites, instead we have gallows and blockhouse sites. And, for years people here and far away didn't agree it really existed. And, ten years ago, during the trial in which the historical court exonerated Leschi, lawyers asked Captain Paul Robson why the U.S. Army thought Leschi shouldn't have been hung. Because, we don't hang soldiers.